The term ‘white elephant’ derives from a story about the king of Siam (Thailand nowadays) who would offer the gift of a white elephant to courtiers he didn’t much like. The cost of maintaining a white elephant would be ruinous but the unlucky courtier could not give the animal away or kill it because this would be an insult to the king. The white elephant legend also surfaces in Burma, Laos and Cambodia, where a white elephant symbolised a monarch’s power and prestige. This animal had no uses other than decorative. Thus do we describe an object we find hard to give away, like the hideous clock from grandma or auntie: a keepsake we dislike but can’t throw out because that might hurt someone’s feelings. Aside from such household goods for sale at school fetes and other fundraising events, the term ‘white elephant’ has been applied to assets and projects undertaken by states or corporations that are considered to be weary, stale, flat and unprofitable. The now retired Concorde supersonic jet has been classified as a white elephant. It cost the French and British governments more than the profit realised from its use, even though the jet was commercially successful for British Airways. A more recent example from London is the Millennium Dome, which raised expectations of revenue that have never been achieved. At the other end of the world, in Melbourne, there’s a Ferris wheel modelled on the London Eye. It’s called the Southern Star and it’s the whitest of elephants, a money drain for its investors and an embarrassment for its engineers. Some people nowadays consider the book to be a white elephant. Lately I’ve visited a number of homes where I’ve seen no sign of a book. There are computers, games consoles, televisions, Blu-Ray, DVD, digital radios, iPads, iPods and e-readers. The people in these houses don’t cherish books. Their old volumes have either gone into storage or the school fete or even the recycling bin. Hoping that I don’t sound too judgemental, I’ve talked with these bookless householders about the changed domestic landscape. They have nothing against books or reading—many are avid readers, in the digital form—but they consider that there are more efficient means available for storing, transmitting and studying ideas. What about the rest of us? Are we entirely innocent of book-white-elephant syndrome? Though I consider myself in the front line of advocacy for this endangered species, I admit that I no longer use a street directory. I can’t recall when I last consulted a phone book. I still often look up words in a dictionary but I also use the on-line variety. I listen to audio books in my car as often as I read paper books. I have read several e-books, even though I swore it would never happen. Never much of an encyclopaedia user, I often consult Wikipedia. As a first stage on the continuum of researching most topics, it’s a useful tool; never to be used exclusively but neither is this facility to be dismissed out of hand. In his closing address at the Sydney Writers’ Festival last year, author James Gleick presented several compelling reasons why the book isn’t doomed. He cited the co-existence of the electric guitar and the acoustic (backformation alert) guitar, the bicycle and the automobile, and the peaceful coexistence of TV, radio and film in the twentieth century zeitgeist. So it will be, Mr Gleick believes, with books and e-books. Writing longhand seldom happens for me anymore. I can’t recall what happened to my old typewriter. I’m on-line every day, wireless or networked. The devil tempts me with all the kingdoms of the world, or so it seems, via a phone in my pocket. Waiting in a queue at a supermarket or an airport is a relative breeze. Waiting for friends at a venue is no longer a chore. I while away such intervals by e-reading material on my phone or tablet. Perhaps soon I will no longer bother with the dictionaries on my shelves, and other reference books. Perhaps that whole section of my home library will grow a pachyderm hide, trunk and big ears. This metamorphosis might even spread to the fiction section. I can swear to myself that I won’t let the elephants win. But how do you stop a stampede? Not long ago I read of a journalist who couldn’t understand the speech of his teenagers. Changelings had taken the place of children who formerly uttered quaint word selections and endearing mispronunciations. In their place, his pre-adults spoke a strange dialect. When their father at last decoded the speech patterns he learned that ‘wicked’ meant ‘good’ and ‘shut up’ meant ‘well, fancy that’. He knew for certain that he’d cracked the code once he realised that his offspring never gave him a direct Yes or No. A reply in the affirmative was ‘whatever,’ while a negative was ‘as if’. Passive-aggressive at best, but mostly just aggressive. Where do these expressions come from? Some have been around so long that we don’t even notice. 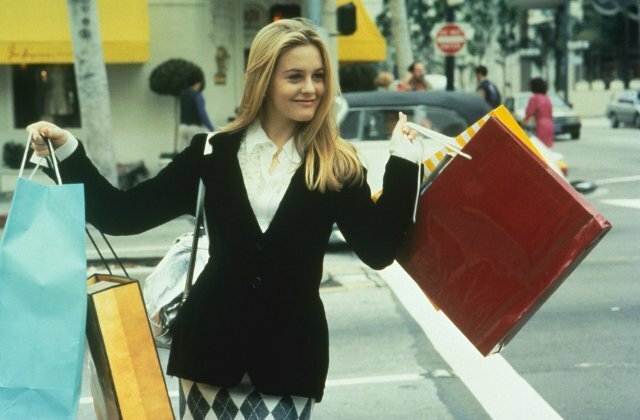 The expression ‘as if’ (meaning ‘not a chance’) received a boost in 1995, from the movie Clueless, a thinly disguised modern-dress version of Jane Austen’s Emma, and starring Alicia Silverstone. But the phrase has been around since the sixteenth century. Before that time, people said ‘as though’ exclusively. Since the late 1500s we’ve been saying ‘as if’ and until shortly before the writing of Clueless, this phrase belonged in sentences as either a coordinating conjunction or an adverb. The film merely introduced it as a stand-alone statement. And it’s an effective retort, no question. I have no problem with it. At least that phrase has a connection with reality. Even the one-word verbal shrug ‘whatever’ serves as a shortened version of ‘whatever-happens-I-will-put-up-with-it,’ or some approximation thereof. ‘As if’ has its idiomatic antecedents in phrases like ‘don’t hold your breath,’ ‘no way, José’ and Eliza Doolittle’s ‘not bloody likely’. By contrast, for a while now I have struggled with the meaningless comparative, e.g. ‘as good as’ or ‘that’s as bad as’. But perhaps, just perhaps, there’s a virtue to be found in this odd habit. The speaker is trying to describe the indescribable. A phenomenon, trait, event or emotion is so overpowering that it defies description. The speaker is at a loss for words. Sure, the speaker might be deficient in vocabulary or just mentally lazy. But it’s also possible that the speaker is trying to convey the immensity of a disaster or triumph, and is intentionally placing it beyond the power of language to describe. Thus we do enter the realm of the ineffable. The ancients knew about beauty, terror or wonder that lay beyond humanity’s ability to describe, let alone to understand. Mortals could not look upon the gods in their eternal truth, only as they appeared in human form. Ancient writings chronicled certain concepts and phenomena that were too great and terrible, or too sacred, to be uttered. The so-called tetragrammaton (from Greek, meaning ‘four letters’) referred to the name for God which could not be spoken. Hebrew has such a theonym, YHWH, which we can approximate in ‘Yahweh,’ a word derived from the Hebrew word ‘to be’. Orthodox Jews are forbidden to pronounce or even write this word in full, which is but a poor human rendering of the Ineffable Name. So in that spirit I have decided to place the kindest possible interpretation on the meaningless comparative. It’s as worthy as. It’s as legitimate as. This attempt at uttering the ineffable may be misguided but that doesn’t mean it shouldn’t be treated as genuine. It won’t hurt me to withhold judgement about teenage inarticulacy. Like. LOL. As if. If it’s true that we are what we eat, then we’re all citizens of the world. Each day I buy my coffee from an Ethiopian café, where the owner brews his own blend. He has proudly installed a mounted display about the history of coffee, detailing the origin of the word and the product from its home in Ethiopia. I have checked his sources and it’s quite true. Coffee entered the English language, as well as our palate, in the mid-seventeenth century. It came from the Kaffa region of Ethiopia, though it took a few linguistic turns through Turkish and Arabic before arriving in England where, by 1675, there were more than 3,000 coffee houses. That got me thinking. What other staple foods entered our language from far-flung shores? If we consider just one simple meal, breakfast, it becomes a United Nations of language. ‘Muesli’ is Swiss-German. Simple and straightforward. Likewise ‘marmalade’ comes via French from the Portuguese (marmelada) though there’s also an earlier Greek word melimelon meaning honey (meli) apple (melon). Still, it’s not too tangled an origin. The orange tree originated in northern India but ‘orange’ arrived via Sanskrit (narangas), Persian (narang) and then Arabic (naranj). It entered the dialect of those indefatigable traders and entrepreneurs the Venetians as naranza (for peculiarities of Venetian, see earlier blog entry ‘Zanies and Zealots’) and then the Italian language as arancia. As the word entered French it underwent an odd separation process (also seen in the words napple and napron) whereby it took the indefinite article ‘un’ because it began with a consonant but then its sound became detached from the noun, jumping to the article (and changing gender), so un narange became une arange, later une orange. It arrived into Medieval English as orenge. Whew. The word ‘juice,’ by contrast, is a lot simpler. Sanskrit (yus), to Latin (ius) to French (jus). Speaking of fruit, aeppel in Old English (Anglo-Saxon) didn’t mean the specific fruit we know as apple; rather it referred to fruit of any kind. As late as the seventeenth century, ‘apple’ was a word for fruit in general. Another breakfast food, the banana (Spanish, via West African) was known in Middle English as ‘appel of paradis’. So, despite excellent translations from the Bible into English by Tyndale and others, the forbidden fruit of Adam and Eve’s tree wasn’t necessarily apple. It might have been grapefruit, avocado or snozberry. Which brings us to cereal. This is easy. Ceres was the Roman goddess of agriculture. American English added this coinage in the late nineteenth century for edible grain. At that time the English still used ‘corn’ to describe wheat, while Scots and Irish used ‘corn’ for oats. Americans limited their use of the word ‘corn’ to a plant the English called ‘maize’ i.e. corn on the cob. Also yummy for breakfast. Bacon: this too is simple. It comes from the French and essentially means ‘back meat,’ i.e. from the back and sides of a pig. ‘Toast’ isn’t a problem either, coming from Old French, where toster meant to toast or grill. Eggs: too easy or over-easy? As described in a previous blog entry (‘Serendipitous Yahoo Quarks’) pioneer English printer William Caxton struggled with the orthography of this word, which has diverse origins and rival claimants to derivation. Our modern word from Old Norse won the tussle, though it was initially spelled egges. ‘Jam’ (‘jelly,’ if you’re American) is a curious one. ‘Jam’ is a product of jamming, i.e. crushing fruit into a preserve. ‘Jelly’ is from Old French, meaning ‘a frost,’ from geler ‘to congeal’. ‘Butter’ has taken a longer path. The word butere is Old English (Anglo-Saxon), from German butter. Some scholars also point to an origin in the Latin word butyrum, from Greek boutyron meaning ‘cow cheese’. All very neat, except that butter wasn’t used in Ancient Greece or Rome. It was used only in India, Iran and Northern Europe. Only butter butters so let’s just thank the Germans for that one. ‘Honey’ has a similarly convoluted tale to tell. Hunig was the Anglo-Saxon word, hunang the Old Norse, and honig the Middle Dutch word. Nice on toast with butter though. Fancy a cup of tea with breakfast? It may take a while to brew, from China (t’e in Amoy dialect and ch’a in Mandarin), by way of the Portuguese (chaa) and Malays (teh), then Dutch (thee) whose speakers imported the leaf via the Dutch East India Company to France (thé), Spain (te) and Germany (tee). Meanwhile the Mandarin form reached as far as Russia (chai), Persia (cha), Greece (tsai), Turkey (cay) and Arabic speakers (shay). So when we brew up a chai tea today, we’re really making tea tea. Like some yoghurt? It’s a mispronunciation of the Turkish word yogurt, where ‘g’ is a soft, sounding similar to our ‘w’. Yog means ‘to condense’ and yogur means ‘to knead’. ‘Milk’ emerged from a wide range of sounds; Anglo-Saxon meoluc, Old Norse mjolk, Old Irish melg, Dutch melk and German milch. The curious thing isn’t the sound but the meaning. It comes from the verb form, and means to wipe, stroke or rub off, i.e. referring to the act of milking an animal. Fancy something else with your bacon and eggs? How about sizzling tomatoes? Director Peter Jackson got into trouble with some fans for including a scene in Lord of the Rings: The Fellowship of the Ring where the hobbits cook tomato with their bacon and eggs. These pedants claimed that tomatoes weren’t mentioned in Tolkien’s work because that vegetable (really a fruit) wasn’t part of the pre-industrial English diet, and therefore didn’t fit the mythology. Hmm. Maybe tomatoes weren’t mentioned but what about tobacco? That weed does feature rather a lot in Tolkien’s books but tobacco didn’t arrive in Europe until the sixteenth century, coming from the new world like the tomato. It’s a curious one, from the Nahuatl word tomatl, meaning ‘the swelling fruit,’ and we inherited the word from the Spanish conquistadors who called it tomate. And to add relish to the bacon, eggs and tomato, how about some mushrooms? This one is an oddity because it comes from French but the French don’t use it. The variants muscheron and musseroun were commonly used in Middle English, via the Anglo-French musherun, and may be a derivative of mousse, for ‘moss’ (via German). 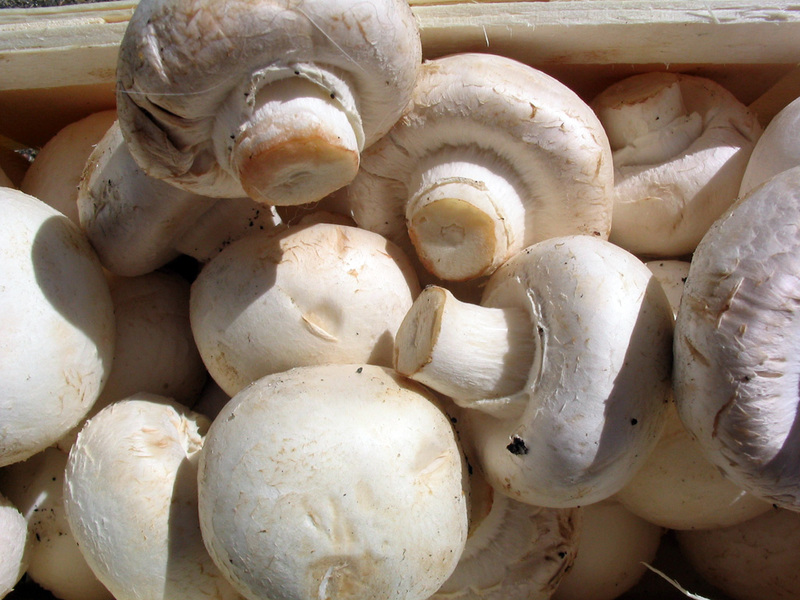 Modern French has a word mousseron for a specific variety of mushroom but in English it’s the generic name, while the French generic name, champignon is a specific variety in English. The word champignon comes from Old French and Vulgar Latin for ‘fungus’ (campiniolus) meaning ‘that which grows in the fields’. C’est la vie. C’est la viande. C’est la victuailles. So next time you sit down to a so-called Full English Breakfast you’ll really be having a pluralistic multi-lingual feast. Caxton faced the problem of which version of English (or Englysshe) he should use, as there were vast differences in regional spelling, let alone pronunciation. When deciding which version to print, he knew he’d be setting not only typeface but also a standard spelling. For example, in choosing to print what we now spell as ‘eggs,’ he was undecided whether to choose ‘egges’ or ‘eyren’. We know which one succeeded but it was a decision he had to repeat hundreds of times for similar version clashes. That this pioneer printer often selected the London dialect isn’t surprising; nor should we be surprised that his word choices tended to favour the learned and commercially thriving triangle of London-Oxford-Cambridge over spelling varieties in the north and west of England. In so doing, Caxton helped to establish or reinforce the primacy of one variety of English over others, and thereby hastened the demise of regional varieties. This may have been a significant step in the evolution of English but it was hardly the only one. During the so-called Great Vowel Shift, our spoken language changed its sounds to a remarkable and dramatic degree. This is evident in samples from printed verse; for example, where ‘join’ rhymes with ‘line’ and where the word ‘peas’ rhymes with ‘ways’. But even before Caxton helped to codify certain of our words and before the mouths of Anglo-Saxon speakers were forming their Middle English vowel sounds, many new words were being created out of existing words. Long before Piers Plowman, before The Canterbury Tales and before many of the Mystery Plays, newfangled words were daily fashioned in everyday speech. Today the pace of change, and the rate at which such words appear and vanish, is commensurate with instant communications. Words like ‘metrosexual,’ ‘blog’ and ‘prequel’ may or may not endure but their turnover rate isn’t necessarily different from past eras: only their potential reach has grown. Over the centuries, thousands upon thousands of words have come and gone, some of them used only by a small number of people in a region, town or other community. Shakespeare alone coined hundreds of words. Many have lasted (e.g. ‘foul-mouthed,’ ‘hunchbacked’ and ‘radiance’) but many have not (e.g. ‘bullyrook,’ ‘keech’ and ‘pignut’). Yet even that writer’s words would only have been heard by a few thousand people were it not for his scribing colleagues Hemmings and Condell, thanks to whom the bard’s words ended up in print, thereby reaching millions over the centuries. Today the glover’s son turned playwright might well have a blog, an agent, and possibly his own chat show. Yet would his words endure as successfully? A time-travelling or cloned Shakespeare might or might not shun newfangled words like ‘bling’ and ‘ginormous’ and he might disparage old-fangled words with new meanings like ‘cougar’ and ‘tweet’. We’ll never know, unless Doctor Who pays him a call and suggests he hitch a ride. Without him, the show must go on and on. We have our less-than-Stratfordian coinages such as ‘frenemy’ and ‘staycation’. They may be ugly but shouting at the sea won’t help. Laughter seems like a healthy response. I like ‘blamestorming’ (for collective action) and ‘percussive maintenance’ (for hitting your PC) because these both encapsulate and satirise our contemporary attempts at the portmanteau. But I believe ‘bromance’ and ‘dramedy’ need to be mocked, and thence relegated to the dustbin of linguistic history, along with ‘jeggings’ and ‘unfriend’. Too much fangled and not enough new. Life imitates art in language too often to be stranger than fiction. Let’s consider some of the juicier examples. ‘Malapropism’ we have already discussed in an earlier blog (‘Calling Mrs Malaprop’). Now I’d like to dwell awhile in contemplation of other words that have their origin in fiction. I’ll bypass the more obvious ones like Frankenstein, Jekyll and Hyde, Romeo and Scrooge. Certainly they have all entered the language as recognisable types but they also retain their literary identities in lasting works of literature. Instead I will drool over some words that have all but lost connection to their fictional sources. Let’s start with ‘gargantuan,’ an adjective for something or someone of immense size. The original Gargantua was a giant, featured in a series of five novels by François Rabelais (1494-1553). He featured, with his son Pantagruel, also a giant, in the series known as La vie de Gargantua et de Pantagruel. Their satirical adventures featured ribald scatological language and episodes of violence and obscenity that caused the French censors to recoil. The term Rabelaisian tends to apply to these works more than any other, yet the word gargantuan has lasted, while the character of Pantagruel has almost vanished from notice. ‘Grok’ originated in a book that I adored as a teenager, Stranger in a Strange Land (1961) by Robert Heinlein. The main character is Valentine Michael Smith, a human who arrives on Earth as an adult, having been born and raised on Mars. In the narrative, Smith uses ‘grok’ often in conversation, a word that arises quite naturally for him. Other characters are too polite to ask but at one point Smith provides an explanation as best he can. He says that ‘grok’ means ‘drink’. It’s not a concept easily defined on Earth because drinking is more important on Mars, where water is scarce. Martians regard the merging of the human body with water as greater than the sum of both. Roughly translated, ‘grok’ is a word that means to achieve complete understanding. Do you grok ‘grok’? Anyone who has read Gulliver’s Travels (1726) will have their favourite of the four books. Mine is the last of them. I think it’s the cleverest and yet the most repellent to modern sensibilities. Anglo-Irish satirist, essayist, pamphleteer, poet and church minister Jonathon Swift (later the Dean of St Patrick’s Cathedral, Dublin) shocked quite a few readers of the eighteenth century with his descriptions of a land where noble and articulate horses (the Houyhnhnms) are the dominant species, while the brutish race of men (the Yahoos) are beast-like creatures with vile personal habits, demonstrating less dignity and regard for hygiene than so-called animals. Viewed in this light, ‘Yahoo’ seems like an odd choice for an Internet search engine that supposedly opens doors to information and enlightenment for twenty-first century humankind. Catch-22 (1961) was Joseph Heller’s first and best novel, though prior to publication it was called Catch-18. Heller changed it when he decided there might be confusion with a recently published wartime thriller Mila 18 by Leon Uris. The title phrase of this black comedy set in war-ravaged Italy in 1943 is reiterated several times during the book. It demonstrates, among other things, the essence of paradox and bureaucratic absurdity. And that is almost the sense in which it has entered wider use in English, though the phrase more often stands as a synonym for ‘no-win situation’ or circular logic. Even those who have never read the book know how to apply the title. ‘Cyberspace’ comes direct from fiction, specifically Neuromancer (1984) by William Gibson, writing in a style now known as ‘cyberpunk, though Gibson’s first used the word in a short story two years earlier called ‘Burning Chrome’. His conception of the word was an illusion shared by consenting parties and experienced daily by billions. The concept had been described a year before, in a story by Vernor Vinge called ‘True Names,’ and the year before that in John M Ford’s novel Web of Angels. But it is Gibson’s coinage that has stuck. He conceived it as a meaningless buzzword, derived from cybernetics, itself a Greek derivative from kybernetes, meaning pilot or steersman. An odd journey for the word, given that cyberspace as we have come to know it has no pilot, or many pilots. A ‘quark’ is a sub-atomic particle that combines to form composite particles known as hadrons. The most stable of these are protons and neutrons, the components of atomic nuclei. The quark model was independently proposed in 1964 by physicists Murray Gell-Mann and George Zweig, after Gell-Mann formulated a particle classification system known as the Eightfold Way. Gell-Mann was unsure what to call the particle. Then he found a reference in Finnegan’s Wake (1939) by James Joyce: ‘Three quarks for Muster Mark…!’ It’s unclear how detailed a reading Gell-Mann gave this novel. This is Joyce’s last book and it is notoriously difficult to read, for many readers (including this one) comprising a prose style that is near impenetrable. According to Gell-Mann, the word represents the cry of the seagull. Like Lewis Carroll before him, Joyce loved portmanteau words. As the main character is a publican and there are phrases in the text partially determined by calls for drinks at the bar, Gell-Mann decided that one source of the gull-like cry ‘Three quarks for Muster Mark’ could be ‘Three quarts for Mister Mark,’ and the number three fitted the way quarks occur in nature. So ‘quark’ it was. Joyce would have enjoyed such a portmanteau origin. It’s almost serendipitous. Which brings me to my favourite word, ‘serendipity,’ the act of making fortunate discoveries by accident. ‘Serendip’ was the Persian (and Urdu) name for Ceylon, now called Sri Lanka. The Three Princes of Serendip is the English version of Peregrinaggio di tre giovani figliuoli del re di Serendippo, whichwas published in Venice in 1557 by Michele Tramezzino. This worthy claimed to have heard the tale from Christophero Armeno who had translated the Persian fairy tale into Italian. The word ‘serendipity’ has entered the English language thanks to Horace (Horatio) Walpole, the Earl of Orford, (1717-1797), art historian, antiquarian and Whig politician. He recalled how the three princes of the tale had recovered a lost camel by a combination of accident and wisdom. What a serendipitous find for a word.